I've just discovered this in the depths of my collection; a 1974 Star Trek Annual published in Britain by World Distributors, which contains what I believe are three full length reprints from the Gold Key Star Trek series (though they may equally well be original). What I was wondering was: how many comics adaptations of Star Trek have there been over the years? 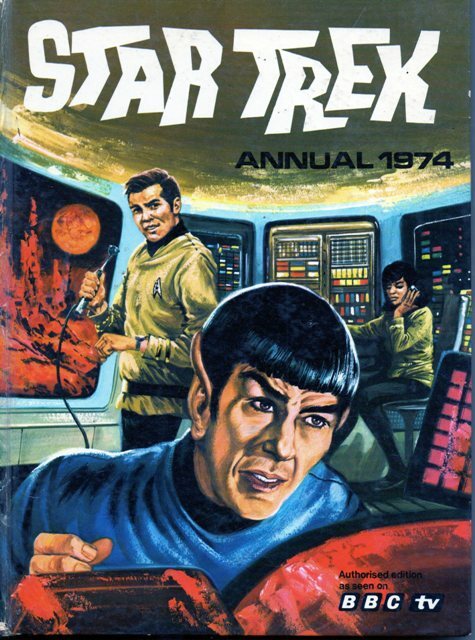 I know that Marvel, DC and Gold Key all published Star Trek at various times in the USA, and in Britain World seem to have published the annuals for about ten years from 1970-1980, while TV21 and TV Comic both also ran Star Trek strips in the 70s. But how many others were there? Beyond that, I think you covered all the bases of my Star Trek comic book knowledge, unless we're counting Malibu and Wildstorm as being separate and distinct from Marvel and DC, respectively. I actually didn't know about Wildstorm! Yeah, I'm not sure how long they had the license or how much they did with it. I think they mostly just did a handful of one-shots, mini-series and graphic novels, nothing ongoing. I think I might Google further on this, now that you've got me curious about it. Does that mean these were the first ones? I have a feeling Gold Key were the first ones. July 1967, I think. Very interesting links indeed! I might have to use that checklist for its intended purpose, now that I know it exists. It had actually never occurred to me that the Star Trek strip in TV Comic was an American reprint! http://www.comics.org/series/name/Star%20Trek/sort/chrono/ from the GCD, but it also includes the comic books for the spin-off shows as well (like Next Gen and Deep Space Nine). There's some stuff on there I'd completely forgotten about (the Marvel UK Specials, for one). If that wiki grows any bigger it's gonna achieve sentience. Lucy McGough wrote: If that wiki grows any bigger it's gonna achieve sentience. Is that the plot for the next Star Trek movie? I haven't seen it. Did I miss much? Lucy McGough wrote: I haven't seen it. Did I miss much? Star Trek: the Motion Picture has a bad reputation which I consider to be quite undeserved. It's really not a bad movie. I saw it in a movie theater on 42nd Street in New York City on December 31, 1979. By the way, it's easy for me to place a date on when I saw that movie . . . went to Times Square later to see the ball drop for January 1, 1980. I saw it at the Odeon in Penge. Which is no longer there, sadly. Lucy McGough wrote: Penge has gone?! >sigh< no, the Odeon has gone, dozy...though Penge ain't what it used to be, either (and it wasn't much to start with). Cinemas are always shutting down. I've heard it blamed on people who buy illegal DVDs instead. Lucy McGough wrote: Cinemas are always shutting down. I've heard it blamed on people who buy illegal DVDs instead. Outrageous ticket prices for lame movies that barely last an hour wouldn't have anything to do with it, I guess. Cinemas started dying off when home video first arrived in the eighties, I think. Ticket prices are outrageous, but movies nowadays are too long, not too short. Lucy McGough wrote: Ticket prices are outrageous, but movies nowadays are too long, not too short. I agree. The average length of a movie used to be 90 minutes, which I think is about right. Two hours in one position and I'm almost incapable of getting out of my seat! I'm sure there never used to be that many adverts. Of course not, and I bet the sweets were neither so numerous nor so overpriced. I remember that, too. Seemed odd, but I enjoyed that run of stories. Didn't they also bring in the characters from the animated series? It's been a long time since I read it, but I think I recall that. He's from the future, where they're all tolerant and utopian and stuff. Also... was it a female Klingon? I have also a less interesting (from what it was written, in my humble opinion) book with the same theme published by Hermes Press some years ago. Nice new profile photo Lucy, btw! I seem to recall the CI thing, but having checked, I no longer seem to have it.